All practices are led by Khenpo Choephel unless otherwise specified. Wednesdays, 7:00-8:30 PM: Deity Practice Chenrezig, embodiment of compassion; Green Tara, female liberator; Vajrapani, skillful means with equanimity; Amitabha, love, peace, and harmony; and Manjushri, wisdom speech. Practices rotate weekly. See Calendar for exact dates. All practices are free to all. Donations are always welcome. 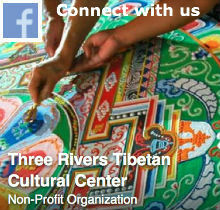 To help support our Dharma practices, we appreciate you giving what you can when you use our center. We provide tea and light snack. Bring whatever you are happy to share. On Sundays, tea and social after practice.